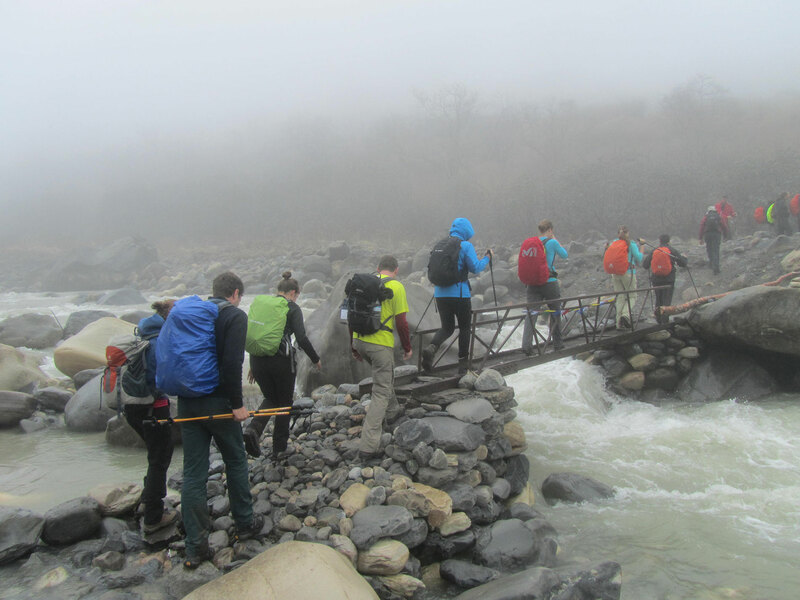 Markha Valley Trek is one of the most varied and beautiful treks in the world. It Ventures high into the Himalayas crossing two passes over 4575m as it circles from the edges of the Indus Valley, down into parts of Zanskar, and passes through terrain those changes from incredibly narrow valleys to wide-open vast expanses! It is made all the more interesting by the ancient form of Buddhism that flourishes in the many monasteries that dot the landscape perched high atop hills. The trails are decorated by elaborate “charters”(shrines) and “Mani”(prayer) walls that further exemplify the region’s total immersion in Buddhist culture. As we trek to the upper end of the Markha Valley we are rewarded with spectacular views of jagged snow-capped peaks before crossing the 5150m Kongmaru La (Pass) and descending to the famous Hemis Monastery, where we end our trek. Reception at the airport, transfer and overnight at hotel. Transfer to domestic airport in the morning flight to Leh. Transfer to hotel, leisurely tour of the city to acclimatize: the old bazaar, the Palace, the Shanti Stupa, mosque; afternoon free. Leave to Likkir in the direction to west of Leh following the Indus valley , Here you will visit majestic monastery of 7th century of Gylukpa sect ( Red hat ) next is ruin of Basgo palace and its famous stucco temple. Now take road to Lamayuru, one of the ancient monastery magnificently perched on the hill . Before budhisme penetrated in the region this site was known as a centre for Bon religion. Stroll around the monastery campus and admire the stunning beauty of landscape. One can again attend the morning puja in the monastery , After breakfast short drive till Alchi , visit Monastery , Among the many temples, caves and stupas built in Ladakh Alchi choskor is the largest and most famous of all of them, built by Rinchen Zangpo ablout 990 years ago. Monastery house valuable mural painting and Thankas. We leave with Pack lunch to Temisgam, a small hidden oasis located in the heart of grand and mineral landscape known for the production of ales and apricot Visit Palas built in 1460, next step to the monastery of Temisgam, Monastery house magnifique freco et statues, Now walk in the village of Tia , visit Nunnery to discover the life of women in the isolated monastery and back to Alchi. Leave to Leh, on the way visit Rizong and Phyang monastery. Rizong : A beautiful monastery built in 1840 by the Lama Tsultrim nyma who wished to restore an orthodox Lamaism that the monk still practice. The monastery is totally isolated, no village having been established in this barren area. At the entrance ceiling decorated with beautiful Manadala. Numerous thankas, representing for most part Budha or Tsonghapa, with the thousand Budhas. Together with the library complete the traditional contents of his dukhang. Phyang Monastery: The monastery was founded 446 years ago (reckoning from 1977). Called Tashi Chozang, there are sacred shrines and various wall paintings are to be seen which date back from the royal period. The protected deity of the monastery is Apchi Choski Dolma. Stroll in village and further drive to Leh. The road until Jhinchen, following the banks of the Indus to the west, we will cross a large tray on the shadow chain of Stok, then enter a gorge that is part of the Hemis National Park. On arrival at Zhingchen where you will meet the trekking crew, we will complete the load distribution and the first day of short hiking begins here, we camp near on flat meadow, after establish the camp you will walk ( one hour both way ) toward the Rumbak village located on the foot of Stok la, its best way to be acclimatization, Have interaction with local, back to campsite. Short day of trek ( for acclimatization ) before crossing the first pass of the trek, Follow the flat trail, after while gradual path along the huge arid slope till Yurtse with its few houses, One can meet the locales ( sub to availability) further gradual uphill trail till the camp site ( upper or lower base ) on base of Gandala. We see beautiful scenery of Yurutse along the mountain. Crossing a small valley is followed by a zigzag climb to the plateau. We continue for nearly three hours down the mountain till the pass, Ganda La. A long descent to Shingo easily leads us in a splendid fashion. After descending for about two hours, we arrive in the Markha valley where we use the beautiful land of Skiu for camping. Short trek for 3 hours. The trail is well defined out along the Markha River bed. At the places you find the trail marked by man wall. Cross the settlements of Narding, Zara and Chalak each having parachute tents. Beyond Chalak, you see green barley fields. The day starts on the right bank of Markha: nice trail with lots of vegetation. Several successive crossings from left bank to right bank happen in Chaluk (little houses); new traverses that flow before it, reaches after a short steep climb the beautiful village of Markha. We set up camp near the river. The trek goes on the right bank of the main valley, the trail may be difficult by the riverbed. Before reaching the village of Hankar, we visit the monastery of Humlung, along the river. We turn from a wide valley on our right. We take a narrow valley that requires us to cross a bridge until the left bank to reach the pasture Tchatchutse. Further trail climbs gradually, the river is rather far to the left (parade). We continue near a small lake, then cross the pastures Nimaling. This is one of the most beautiful high valleys in Ladakh dominated by Yatse Kang (6400 m). Many roads leading to the summit are rather difficult. A zigzag ascend of about two hours to the pass Konmaru, which offers panoramic views of the Indus valley, remote Zanskar range and of far Karakoram. Then we continue with a steep descent to the camp site. The trail crosses the beautiful river bed, difficult descent for the horses. After several river crossings, arrive at Shang, you will be picked by vehicle to leh, enroute visit Hemis monastery. By evening reach at Leh. Night in hotel. Day18 : Free day at Leh. Transfer from airport to hotel, check in at 12 noon, afternoon visit humaun Tomb and Laxminarayan temple, if time a left visit Sigh Gurudwara ( temple and janpath half day visit to new Delhi, night in hotel. Drive to Agra, upon arrival proceed for sightseeing, visit world famous Taj Mahal, built by Shah Jehan in the memory of his beloved wife Mumtaj Mahal. It took 22 years and 20,000 people to build the Taj Mahal. Red fort, evening dinner in local restaurant where you will taste the mughlai cuisine, Night in hotel. Back to Delhi via Fathepur Sikiri, a sand stone city once capital of Mughal emperor Abkar. Late afternoon reached Delhi. Dear Jagat, both treks are unforgettable for us and we thank you and our guide Toran (2015) as well as the porters Khem and Ram / female guide Pasang (2016) and our porters Khem and Nanda for a wonderful time. We felt us like a small family and shared the beautiful views and a lot of fun together. We would recommend Himalayan Leaders to all trekkers and as soon as possible we will come back.